Doing a bit of research for a game review can be an enlightening experience. I've spent many an hour in the dead of night wondering why it was that the robot voice in Berzerk shouts out 'GET THE CHICKEN' at random intervals, and today it turns out that I've been playing the game wrong all these years; this derogatory insult is actually the result of exiting a screen without killing all of the robots first. I'd previously assumed that this was either some bizarre developer in-joke, or that there was a super rare chicken enemy that you had to kill. 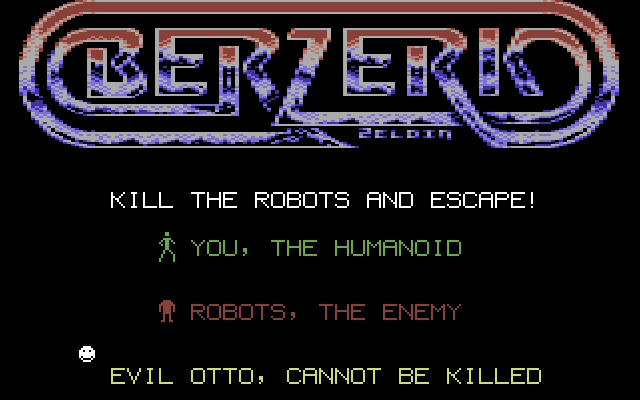 Likewise, I'd always assumed that Berzerk would have an end screen, or final room (possibly full of chickens?) - but no, it continues forever, so again I was wrong (and disappointed, so it happens). With an introduction like this you might have assumed that I'm a complete newcomer to the game, whereas in fact it used to be one of my preferred pocket-money eaters in the arcades when I was a kid. I'm not embarrassed to admit that I love robots, so it goes without saying that an arcade game featuring them in any capacity is likely to be a winner in my eyes - and hence why Berzerk, a classic arena shmup all about killing robots whilst navigating through a deadly futuristic maze, became a favourite. Despite it's popularity, the original arcade game was only officially ported to three home systems; the Atari 2600, Atari 5200 and Vectrex. 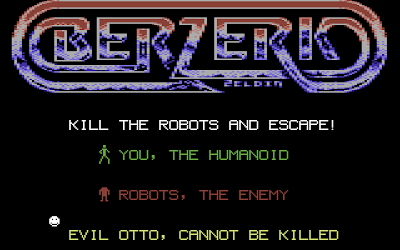 Over the years, various other unofficial conversions have emerged, but none of them compare to the original as favourably as Martin Piper's Berzerk Redux for the C64. Originally released back in 2009 (and followed by a number of updates), the game was recently re-released as a single-file crack by the mighty Onslaught group complete with extensive documentation (albeit mainly borrowed from wikipedia) and a variety of trainers - so I decided that now would be a good time to finally give this worthy addition to the C64 coin-op collection a long-overdue write up. First of all, if you're planning to play this on vintage hardware, you're going to want to use either a classic breadbin or a C128 because the game sounds pretty poor on machines with the newer SID chip (8580) (the same applies for emulation - ensure that you select the correct SID). The reason for this is that the game utilises a bug in the original 6581 chip that enables the machine to emit sampled sounds, and Martin Piper and his cohorts have done a sterling job in forcing sound akin to the arcade out of the C64 (as has Richard with his original adrenalin-pumping title track). The in-game graphics are also very similar to the arcade, with Zeldin opting to use mono hi-res sprites (like the original) rather than attempting to recreate the game in blocky multi-colour mode. However, the game-play is where Berzerk Redux really shines. Based on the later revision of the arcade (with the robots changing colour and becoming more fearsome foes as the player score increases), this conversion of the seminal coin-op is pretty much spot on - and therefore it goes without saying that it's a very, very good game. I find it hard to believe that people reading this website (and hence interested in the retro gaming scene) will be unfamiliar with the original, so I won't bother going into Berzerk's simple mechanics. Everything that made the arcade so popular is present and correct, even down to anally retentive details such as the number of enemy shots on screen at once and accurate firing position; it's just like having the coin-op in your home (but with the added bonus of a high score table that saves to disk, as well as it taking up considerably less space in your living room). If this had come out in the 80/90's as an official C64 title it would have been massively successful. As a modern release, Berzerk Redux retains the same timeless qualities of the original and is a must have for any C64 owner (as long as you have a 6581). It would have been amazing if the new Onslaught release had featured an optional 8580 optimised in-game soundtrack to replace the speech (selectable from the trainer menu perhaps), but alas, it was not to be. So instead, whenever I want to play this I have to go to the trouble of swapping around my C64C with my C128. A consideration for a future re-release perhaps? Download the original release here (from the Commodore Scene Database). Download the Onslaught re-release here (from the Commodore Scene Database). The quote you are referring to is "CHICKEN! FIGHT LIKE A ROBOT!" Not "GET THE CHICKEN." In Berzerk Redux the voice actually says both quotes. I'd falsely(?) assumed that the arcade did the same. I do recall it saying CHICKEN! FIGHT LIKE A ROBOT, but the quote from the C64 version was shorter and more amusing, so I used that instead.